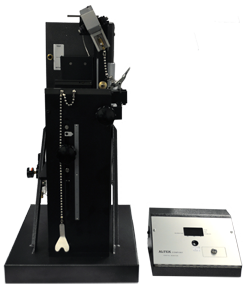 The MODEL 9212BE2 Pop/Tear Tester is used to determine the forces required to first "pop" the score and then "tear" the end panel back on a full opening end. An appropriate set of Change Parts, determined by the can or end type and size being tested, are installed on the unit. A sample is clamped in place and a hook is attached to the tab. The tab is first rotated to determine the force required to pop the score, and then pulled to measure the force required to tear the end panel open. At the conclusion of each test, failure forces are displayed on the front panel of the Digital Monitor. This unit requires the use of Change Parts. Please see 9752 ; 9753 ; 9754 or 9755 for futher information.